A Greece vacation can take you back in time to the ancient civilizations, on an exploration with the mythical Greek gods or to sun soaked beaches and azure ocean water. Greece is a land filled with whitewashed buildings that sit against the bright blue skies and also a land filled with the history of the ages, all of which is just waiting to be discovered. If your Greece travel first takes you to Athens, the capital and largest city in the country, you are in for a treat as the city houses the most popular of all Greece tourist attractions. The Acropolis is the ‘sacred rock’ of Athens and is an important site to the city as well as being one of the most recognized places in the world. 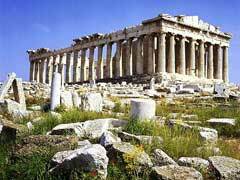 Part of the complex is the Parthenon, dedicated to the goddess Athena where marble pillars stand amid the ruins of the architectural masterpiece that once was. The Acropolis museum allows visitors to watch excavation work from the glass floors and gives wonderful views of the site itself through the walls of windows. Many archeological finds and statutes are on display in the museum that sits amid the wonder of the area overlooking the city. Also located in Athens is the Ionian Temple of Nike from the 5th century BC and the Olympeion, or temple of Olympian Zeus which is the largest temple in the country, with 15 of its stately columns still standing today, it makes another impressive place to explore. The Benaki Museum shares with visitors the cultural and historical development of the country, while the Temple of Hephaestus and the Agora are both sites of ruins of a time gone by. For a refreshing change of pace on your Greece vacation, the Hammam Baths, the only authentic hammam in the city will pamper you into total relaxation and there is always the National Archeology Museum if you haven’t had enough of the ancient civilizations. The largest and most important complex of Eastern Orthodox monasteries can be found in Meteora, located in the northwestern part of the country. This World Heritage Site comprises six monasteries built on sandstone pillars that tower over the neighboring towns. Speaking of towering, Greece is also home to Mount Olympus, the legendary home of the gods of yore. Located in the northeastern part of the country, the mountain is part of the Olympus National Park and is certainly a well-known Greece tourist attraction in its own right. Here, those traveling in Greece can hike the trails or climb amid the 1700 species of plants that call the area home. It is also home to many animals including wolves, wild cats, deer and many species of birds and butterflies. Across the country from Athens and located near the western shore on the Ionian Sea is the city of Olympia. 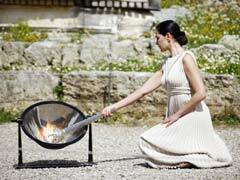 Here is where the Olympic Flame is lit before each new Olympic Games before it is sent on its way to the country hosting the events. Ancient Olympia is a World Heritage Site and offers those on a Greece vacation a chance to see the ancient ruins of the city and a museum not far from the Temple of Hera where they do the ceremonial torch lighting. The Museum of the Olympic Games is also in the city and houses the original field, statues and many artifacts that follow the history of the famous Games from their inception to present day. Greece is a country comprised of not only mainland but also many islands that are sprinkled around its three coastlines. A Greek Islands vacation can be accomodated via cruise ship (many lines offer stops on many of the islands) or by ferry between certain islands or of course you can fly to one and spend your entire vacation there, but island hopping is a great way to see many local island flavors in one trip, especially since there is so much to see on the major islands. Corfu is located on the western side of the mainland and offers scenery, turquoise coves, pine tree covered hills and beaches for your Greece vacation. Mount Pankokrator, the old town of Kerkyra and the Old Perithia, a deserted village are all Greece tourist attractions that are just waiting to be explored. The largest of the islands is Crete, and it also offers travelers to Greece the most varied of landscapes from lush evergreens to arid palm groves. Beaches, archeological sites, ancient cities and 1000 miles of coastline, gorges and ancient caves are all located in this island to the south of the mainland. Close to the Turkish coast we find Rhodes with its Turkish influences and medieval capital city. Bays, coves, cut stone buildings and white sand make this a great place for a Greek Island vacation while its many underwater caves make it a mecca for divers. Mykonos is the party island that is young and hip and caters to the jet set crowd. When they’re not partying, you will find them windsurfing, riding in the waves or parasailing to pass the time till the next party. One of the best beaches in the country can be found on the island of Ios, but the island to really get away from the everyday while on your Greece vacation is Lesvos. As the third largest, this island offers castles and ancient sites, petrified forests, spas and thermal baths and monasteries all in an out of the way place that isn’t on many tourists’ radars. 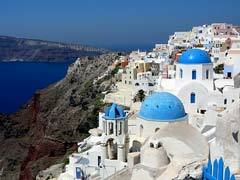 Your Greek Islands vacation can continue in Santorini where the whitewashed buildings on the volcanic cliffs against the blue of the sky and water make it an idyllic setting for any vacation and the 4000 year history offers plenty of Santorini things to see and do. Surrounded by clean Ionian Sea, the island of Zakynthos is a great place to scuba dive or snorkel amid the reefs, and underwater caves. Sea turtles, mountains and surfing make this an ideal stop on any Greek Islands vacation. 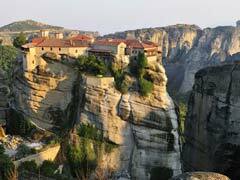 Whether you stay on the mainland or a Greek Islands vacation is on the agenda, you are never far from a fantastic Greece tourist attraction; mountains, beaches, world heritage sites or famous ruins, they are all found in this southeast European country.